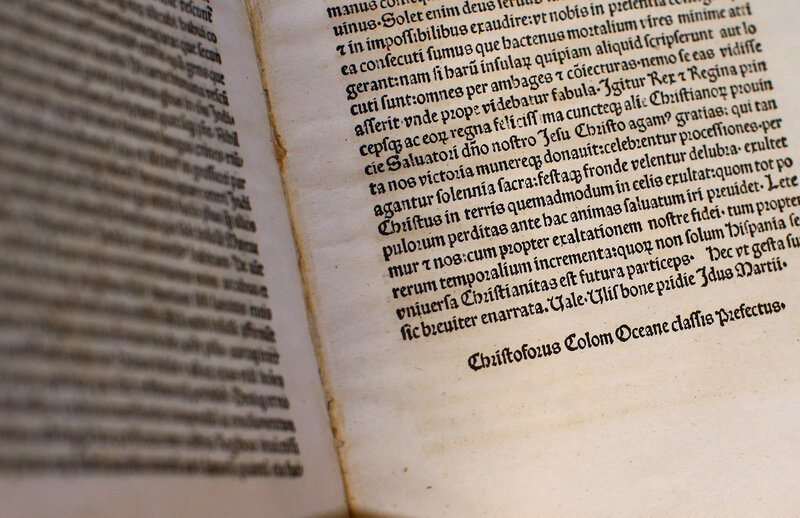 Yet another rare copy of the letter Christopher Columbus wrote reporting his discovery of the “Indies” has been returned to the institution from which it was stolen. Two years ago the letter, stolen from Florence’s Riccardiana Library before 1990 and replaced with a forgery, was found in the Library of Congress and returned to Florence. Just last week a copy found in a private collection and returned to the the National Library of Catalonia in Barcelona. This time it’s the Vatican Library’s turn. All three of them were replaced by plausible forgeries and the originals smuggled out of the countries of origin, eventually making their way to the United States. The Vatican acquired its copy in 1921 as part of a larger collection of rare books and manuscripts bequeathed by bibliophile Giovanni Francesco De Rossi. They’re not sure when it was stolen, but likely before 2007 when security at the library was massively increased. The forgery was noticed by a rare book and manuscript expert who also spotted similar substitutions in other European libraries and alerted Homeland Security to the thefts in 2011. It was purchased for $875,000 by the collector, David Parsons of Atlanta, Georgia, from a rare book dealer in 2004. Nine years later, Parsons asked the same rare book expert to examine his volume to determine its authenticity. The expert found that the letter was in a newer binding, but was otherwise identical to the Vatican’s copy. Parsons died in 2014. HSI agents contacted his widow Mary last year about the suspected theft. The rare book expert’s assessment was confirmed when the letter and the Vatican’s volume were compared side by side. The dimensions of the binding and the remains of the original sewing on the letter were a perfect match. Mary Parsons relinquished all property claims and the letter was returned to the Vatican in an official ceremony on Thursday, June 14th. As in the news stories about the repatriation of the Riccardiana Library’s letter, there is persistent confusion about when the original was written to whom and the copies derived from it. Columbus wrote the letter in February 1493, one of two he sent to his Spanish patrons after his arrival in Palos in March. The persistent error is that the copies were not made from the letter he sent to monarchs Ferdinand and Isabella, but rather from the one he sent to finance minister Luis de Santangel. From what we know, the two letters were near duplicates in the content regarding the Indies, but it’s a lazy shorthand to elide the fact that the published letter was not, in fact, written to the monarchs. Ferdinand and Isabella deliberately kept their letter under wraps so we don’t know exactly what Columbus wrote to them. It was never published and the original is lost. It was the Santangel letter that spread like wildfire less than a month after its dispatch. The Santangel letter was first published in Spanish by Pere Posa in April of 1493, a few weeks after Columbus sent it. The next month a Latin translation of it was printed in Rome by Stephen Plannck. As that edition had a glaring omission in the introduction — Queen Isabella’s name was left out — Plannck quickly printed a second edition. That one included the names of both monarchs. It also changed the name of the recipient from Raphael Sanxis to Gabriel Sanchez, neither of them accurate, the second a mistaken assumption by translator Aliander de Cosco. 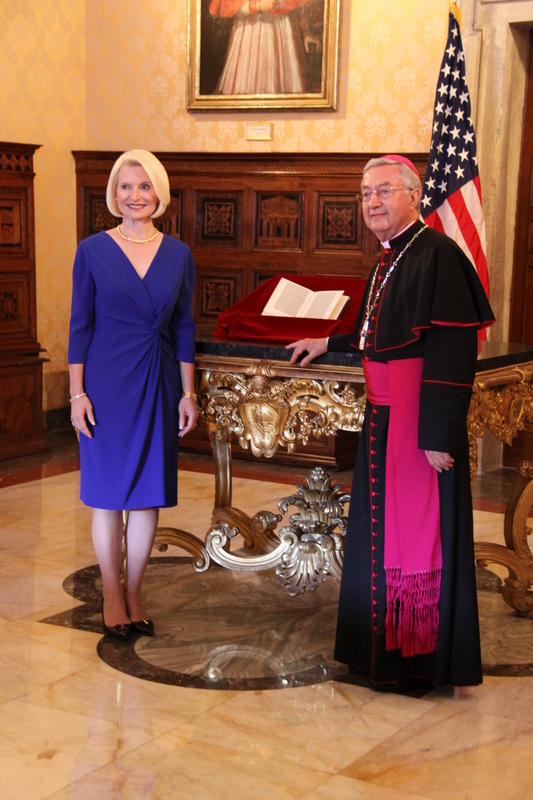 Not to be peevish about it, but it’s blatantly clear from the official photograph of the first page of the letter released by the US Embassy to the Holy See that it is a print of Plannck’s second edition, and some of the stories even note that it’s a Plannck II while still claiming it was written to Ferdinand and Isabella. You don’t have to read Latin to identify the tell-tale names, including the recipient who while misnamed, is explicitly NOT Ferdinand and/or Isabella. 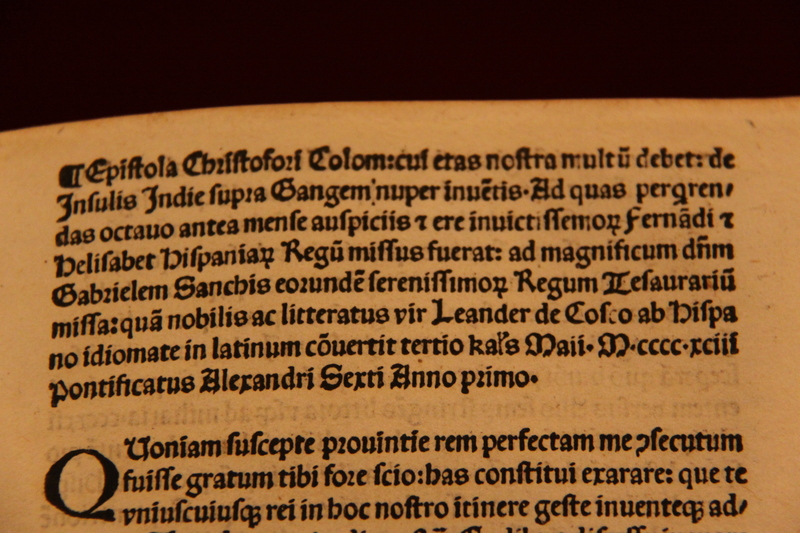 Also, it wasn’t “copied by hand in Latin.” It was translated into Latin and printed, as in on a printing press. That’s just sloppy. Española is a marvel; the mountains and hills, and plains, and fields, and the soil, so beautiful and rich for planting and sowing, for breeding cattle of all sorts, for building of towns and villages. There could be no believing, without seeing, such harbours as are here, as well as the many and great rivers, and excellent waters, most of which contain gold. In the trees and fruits and plants, there are great diversities from those of Juana. In this, there are many spiceries, and great mines of gold and other metals. The people of this island, and of all the others that I have found and seen, or not seen, all go naked, men and women, just as their mothers bring them forth ; although some women cover a single place with the leaf of a plant, or a cotton something which they make for that purpose. They have no iron or steel, nor any weapons ; nor are they fit thereunto ; not because they be not a well-formed people and of fair stature, but that they are most wondrously timorous. They have no other weapons than the stems of reeds in their seeding state, on the end of which they fix little sharpened stakes. Even these, they dare not use ; for many times has it happened that I sent two or three men ashore to some village to parley, and countless numbers of them sallied forth, but as soon as they saw those approach, they fled away in such wise that even a father would not wait for his son. And this was not because any hurt had ever done to any of them : — on the contrary, at every headland where I have gone and been able to hold speech with them, I gave them of everything which I had, as well cloth as many other things, without accepting aught therefor — ; but such they are, incurably timid. It is true that since they have become more assured, and are losing that terror, they are artless and generous with what they have, to such a degree as no one would believe but him who had seen it. Of anything they have, if it be asked for, they never say no, but do rather invite the person to accept it, and show as much lovingness as though they would give their hearts. […] They took even pieces of broken barrel-hoops, and gave whatever they had, like senseless brutes ; insomuch that it seemed to me ill. I forbade it, and I gave gratuitously a thousand useful things that I carried, in order that they may conceive affection, and furthermore may be made Christians ; for they are inclined to the love and service of their Highnesses and of all the Castilian nation, and they strive to combine in giving us things which they have in abundance, and of which we are in need. They have in all the islands very many canoes, after the manner of rowing-galleys, some larger, some smaller ; and a good many are larger than a galley of eighteen benches. They are not so wide, because they are made of a single log of timber, but a galley could not keep up with them in rowing, for their motion is a thing beyond belief. And with these, they navigate through all those islands which are numberless, and ply their traffic. I have seen some of those canoes with seventy, and eighty, men in them, each one with his oar. In all those islands, I saw not much diversity in the looks of the people, nor in their manners and language ; but they all understand each other, which is a thing of singular towardness for what I hope their Highnesses will determine, as to making them conversant with our holy faith, unto which they are well disposed.